GENEVA, Oct 26 2017 - When primary school headmaster Abdul Jabbar Mahmoud set off from Shamlapur on his motorbike heading to Teknaf town, at the southern tip of Bangladesh for his monthly education department meeting, he had no idea that by the end of the day he would return home with seven extra mouths to feed. As his moped weaved between the potholes, his thoughts wandered to the day’s meeting between the sub-district’s headmasters and the education officer. As he sped along, engrossed in his thoughts, he saw something out of the corner of his eye. He slowed down and stopped. “I saw them sitting on the roadside helplessly. Then I noticed the two babies. It touched me emotionally. I could not keep on riding anymore,” he said. On the side of the road, huddled together, was a family of seven Rohingya refugees who had arrived by boat a few days earlier. They had nowhere to go, and unused to begging, were sitting by the roadside waiting for a miracle. “They hardly had any clothes. They were barefoot, alone, helpless; they had nothing with them; no pots, no furniture, no bags, anything. All they had were their babies on their lap,” Abdul said, choking with emotion. “Their babies were crying for water. They didn’t even have water to drink,” he recalled, breaking down in sobs. Abdul reacted with the only way he knew how to — compassionately. Like many Bangladeshis, the headmaster, who earns a modest 25,000 Takas (USD 305) a month and has a wife and three children of his own to support, did the one thing he believed to be right. He adopted the Rohingya family and took them back with him to share his family’s modest house in Shamlapur. Shamlapur, in Teknaf sub-district, is now a major host community for Rohingya refugees arriving in Cox’s Bazar and is one of 99 similar locations hosting a total of around 103,000 refugees. There are 41 host community sites in Teknaf, 25 in Ukhia, 10 in Ramu, and 20 in Cox’s Bazar Sadar — all of them facing mounting hardships and shortages. The family of seven who came home with Abdul — the parents, three teenage daughters and two small boys — are now living in two rooms in Abdul’s house. They described how they fled from their village in Myanmar’s North Rakhine State. The father — Asif — was a relatively well-off landowner and rice farmer with a small business. They owned a two-floor house. Their daughters, aged 15, 16 and 17, dressed well and would soon be thinking of marriage. Mahmoud’s wife had some gold jewellery and all the comforts she needed. Then the soldiers came on a killing spree. Asif’s 25-year-old son, Mojidollah, was captured and most likely killed. 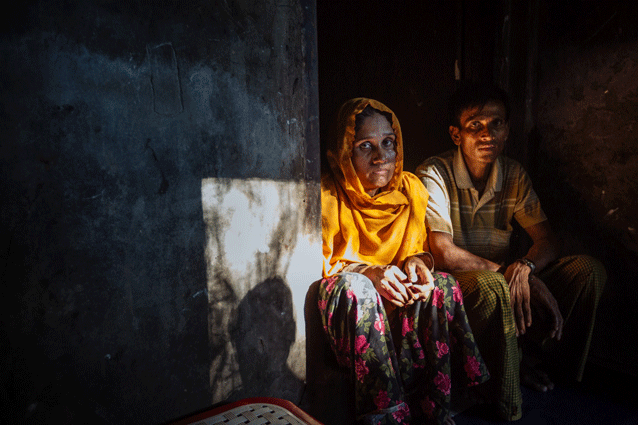 Asif gathered the rest of his family and fled, only to watch his home burn from a distance. They walked for an entire day until they reached safety in the hills, together with nearly 800 other villagers. They spent two weeks in the jungle surviving on the food that they had managed to bring with them before escaping the village. When the food ran out and they knew it was no longer safe to stay, they made their way to the nearest beach to find a boat. Asif found a Bangladeshi fishing boat and struck a deal for 15,000 Takas to take his family across the border to Bangladesh. He paid using his wife’s gold earrings, putting his family’s safety and wellbeing above any other concerns. The fishing boat brought them to safety, and but the family found themselves homeless with nowhere to go. Unused to begging or taking charity, they sat by the roadside hoping to be rescued by one of the humanitarian agencies and taken to a camp or shelter. When Abdul found them first, they had slept in the open for two days and the children were tired, hungry and thirsty. It did not take long for the headmaster to decide on what to do; he made up his mind there and then to take them home and offer them shelter. “I could not just leave them on their own and move on. I took them in. I brought them home and arranged showers for them. After they had washed, I provided them with food and a place to sleep,” he said. “They slept for a day and night. They needed a lot of treatment. They were dehydrated, so I gave them salines. They were very sick and exhausted. When they woke up, they spoke only a few words. They could not eat our food, because they have different food habits. So I took them to the market to buy what they needed,” he explained. “The girls also had some emergency requirements for their menstruation periods. I bought them those things from the market. I did all these things for free. I didn’t take any money,” he said. Although grateful to Abdul’s generosity, Asif and his family are still struggling to come to terms with their loss and current situation. His wife, Mariam, cried when asked about how she was coping, recalling how she had to sell her gold earrings so the family could cross the border. 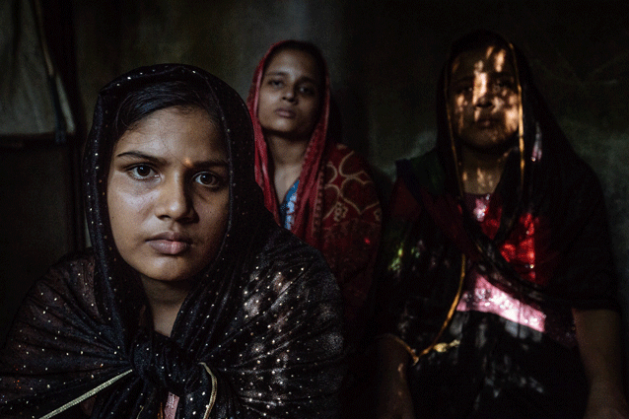 Assif and Mariam, now worry about the future of the girls and how they will be able to marry in Bangladesh — a significant cultural concerns in Rohingya communities, where girls marry at a young age. “How can I provide a dowry here?” he asked. He admitted that when the children are asleep, he and his wife stay up talking about their myriad of problems. But mostly they talk about their eldest son, Mojidollah. They are slowly coming to terms with the fact that he has probably been killed and they are unlikely to ever see him again. An estimated 603,000 refugees have arrived in Cox’s Bazar since August 25, joining some 200,000 others already sheltering in the settlements. Most of the new arrivals come with nothing but the clothes on their back, often having walked for days without food or water. Many have experienced devastating physical and emotional trauma. This article was written by Hala Jaber, the UN Migration Agency’s Spokesperson in Cox’s Bazar, on the launch of the Cox’s Bazar Appeal.